There’s just TWO weeks left until Ben’s Football Camp is finally here!! Share your photos and your thoughts on the camp with us! Email them to [email protected] and we’ll post them right here! Wait! You haven’t signed your youngster up yet? That’s okay – there’s still time! And you can still use the code BigBen7 for $20 off the registration fee. 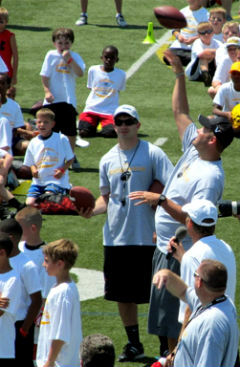 Your child can join Ben for some football fun and instruction on June 16th & 17th. Some of #7’s teammates will likely make an appearance as well! Children that attend Ben’s Camp have had the opportunity to meet and get personal instruction from Brett Keisel, Charlie Batch, as well as the man himself, Coach Tomlin! You might even get an appearance by Benjamin Jr and his little sister, Baylee this year! The camp is sponsored by Giant Eagle and Heinz! *Thank you to Camp Grandmother Anita Doddroe for the photos! ← May Fan Photos are here!